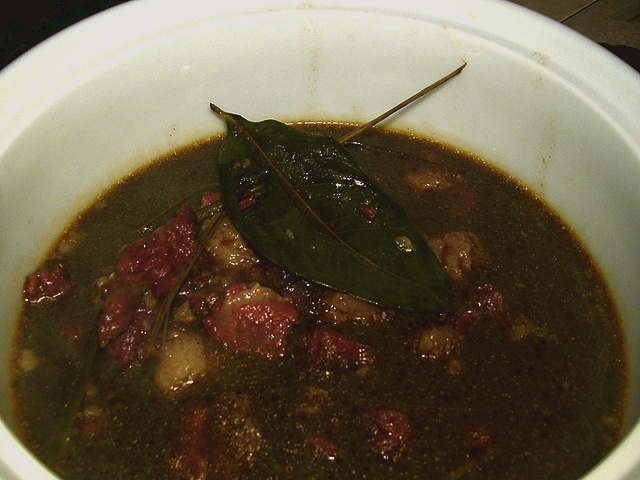 Rawon is a strong rich tasting beef black soup originated from Surabaya, Indonesia. It uses black nuts (buah keluak) as the main spice which gives the strong nutty flavor and dark color to the soup. This dish is popular among Malay Singaporeans. Cut beef meat and innards into desired cube size. Wash and boil with 3 litres of water till tender. Keep the meat together with the stock in the pot for use later. Heat oil in a frying pan, fry ground rempah – onion, garlic, ginger and dried chillies till fragrant. Add in ground buah keras and buah keluak. Stir and mix well for 2 minutes. Next, add in cumin and coriander powder and fry till aroma. Pour the sauteed rempah into the beef pot. Add in lemongrass, galangal, kaffir lime leaves and salt to taste. Cook over medium heat and let it boil. Stirring well. Lower the flame and simmer again for another 15 minutes. Turn off the heat. Serve Rawon together with rice, bergedil, tempe, paru goreng, serunding, sambal belacan and other dishes. look at those fats in the black soup!! tempting but dangerous lol!